Please sign in here or Register for KPMG Tax Now if you don't already have an account. KPMG Tax Now is a digital media website that brings together industry-leading tax news, insights and more from our global network of experts. We are passionate about providing insightful and relevant information to you regarding tax in Australia and overseas, shining the light on ideas not covered elsewhere. Stay informed of important policy and legislation changes, and what it means to you and your business. 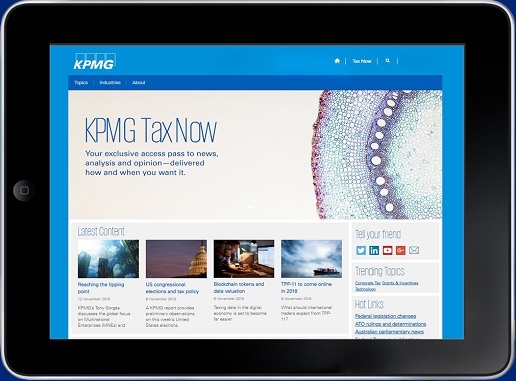 Subscribe to our KPMG Tax Now platform to receive regular updates, access to exclusive content, receive invitations to special events and become involved in our community. More information on KPMG Tax Now can be found here. © 2018 KPMG, an Australian partnership and a member firm of the KPMG network of independent member firms affiliated with KPMG International Cooperative (“KPMG International”), a Swiss entity. All rights reserved. The KPMG name and logo are registered trademarks of KPMG International. Liability limited by a scheme approved under Professional Standards Legislation.